Safe on all body parts. Soothing and easy to use. as detailed in the clinical trial conducted at the I. M. Sechenov Clinic October 31, 2000. Results vary. 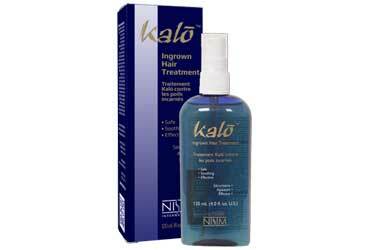 After removing unwanted hair by the root apply Kalo Hair Inhibiting Spray to reduce hair from growing back. Pack includes Kalo spray and Kalo Ingrown Hair treatment. 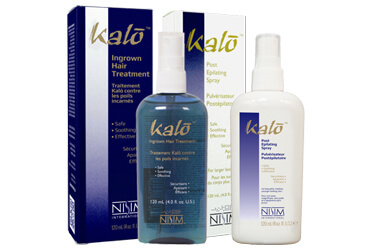 Kalo Ingrown Hair Treatment can be applied to all types of hair removal rashes and irritations. Kalo IHT softens the skin and exfoliates the affected area providing relief from pimples, ingrown hair, razor bumps and redness. Kalo Ingrown Hair Treatment is an effective additional product to the Kalo line that helps to reduce ingrown hairs and shaving bumps. Our Kalo Ingrown Hair Treatment can be used as a standalone product to prevent ingrown hairs in addition to the Kalo Post Epilating Spray for inhibiting hair regrowth. 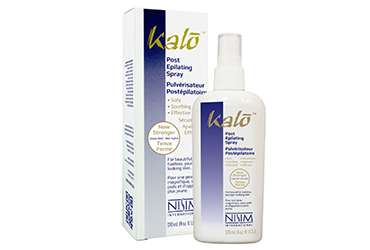 **Kalo is also very effective at slowing the hair growth down when used after shaving. Introduced in early 1997 KaloÂ® was the first product of its kind to be released on the market. KaloÂ® is sold internationally, currently in over 40 countries. Usage based on 3 applications immediately after waxing and 3 applications the following day (i.e. total of 6 applications per epilating session). Amount of product used will vary due to: Size of person/body part and dryness/absorbency of skin. *as detailed in the clinical trial conducted at the I. M. Sechenov Clinic October 31, 2000. Results vary.